One of my favourite workshops to run over the years is on the topic of film scoring. Lately I’ve had an interest in adding video game music composing into my workshop “repertoire” so I’ve been doing some research into how to break it down and make it work effectively for students. 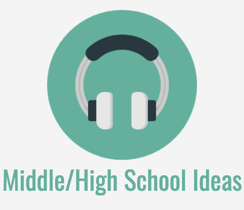 I wanted to have 2-3 video game scoring projects that could be done by students in grades 5 and up. There are a lot of similarities between film music and video game soundtracks. There are also a couple of subtle but important differences. In a video game soundtrack, music can directly affect how a player emotionally reacts in a gaming scenario. Think of that time you played a game in which the music grew in intensity: your heart started to beat faster, your palms became sweaty and suddenly your game character died because you couldn’t stay calm enough to succeed. I know more than one person that has turned off the sound on a game in order to help them achieve a difficult level! This is connected to the most important difference between film scoring and video game scoring: the way in which a player reacts in a game has a direct effect on the soundtrack itself. The player’s actions determine how long a scene will last, how abruptly a level ends and when the battle will begin. Chance Thomas – composer of a number of video game soundtracks including DOTA 2 – describes the player as the “director and producer” of the soundtrack. It was this last aspect that I found most interesting. Film composers compose their soundtrack to the “locked picture” – the final, edited version of the film. They know exactly how long each musical cue needs to be, when the hit points occur and when the action will take place. But in a video game the length of each scene (or level) can vary greatly. One player may move through a section quickly and another may take a long time and changes in gameplay within a level are triggered by the actions of the player. So how does the video game music composer logistically work with this in mind? I was lucky enough to catch a webinar run by Noteflight which answered this question perfectly: an online masterclass titled Video Game Composers – the Five Critical Skills. The presenter was the aforementioned Chance Thomas, author of Composing Music for Games and he described the approach that many game composers take: they compose a series small “blocks” of music which can vary in length and be connected in any order. Early video game music was generated by computer chip and sounded very synthesised. Think Super Mario Bros. There are even a number of composers who use the sampled sounds of computers to create original music – a style known as Chiptune music. A few weeks ago I stumbled on the free online tool Beepbox which is the perfect resource for students to use to create their own Super Mario-style theme. 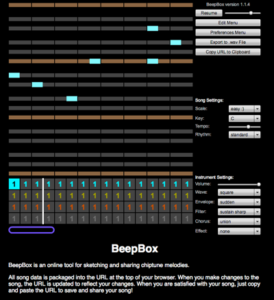 Beepbox allows you to do this simply and easily and the result is a super-cool very retro sounding game theme! Chance Thomas talks about the use of a “layered loop” in gaming music: a loop of music that can be played over and over again and that changes or grows in intensity through the clever use of varying orchestration. Taking this concept, students can create an epic battle theme which is 4 bars in length, but has 3 different versions. For this more in-depth project, it’s best to use multitrack recording software (DAW) such as GarageBand, Mixcraft, Abelton Live, Logic, Pro Tools, Soundation or Soundtrap. I’ve also done a great version of this on the iPad using the GarageBand app and it would work well in the Music Studio app (Xewton) too. Choose a software program or app that allows students to record their own software instrument parts – at least 8-10 tracks minimum and preferably one that has some orchestral instrument sounds. After the game music has been composed by students, they can match it up with footage of an actual video game walkthrough (you can find some here) or with still images from different game scenes. 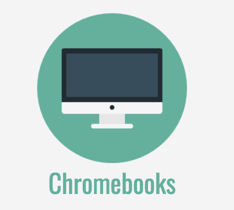 To do that, you’ll need to use video editing software, or a music software program that allows you to import video (such as Garageband, Mixcraft, Logic or Pro Tools). 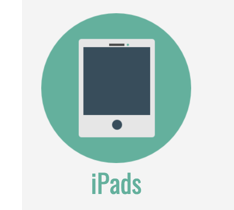 On iPad, you can “Share” your GarageBand video game theme straight across to the iMovie app where you can match the music with the game footage or images. 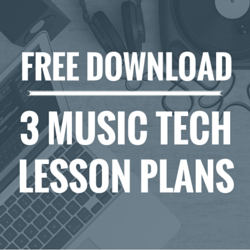 There was quite a bit of interest in this topic inside the Midnight Music Community – my online professional development community for teachers who want practical tips on how to use technology in music education. I ended up creating a 5-part video series that covers the background information and walks you through exactly how to do the 2 composition projects mentioned above using a variety of software options including GarageBand, Soundation, Mixcraft and GarageBand on iPad. The tutorial video for project #1 covers how to get the most out of Beepbox, how to use the settings and how you can extend the project by exporting the finished theme in order for students to add an audio recording of themselves singing or playing. The video for project #2 reveals my epic battle music “recipe” – the simple way that you can provide students with a framework for composing their own original battle music theme, in the style of Game Of Thrones and other similar themes. 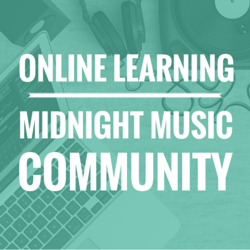 If you’re interested in learning more about this project and seeing the step-by-step tutorial videos, you can become a member of the Midnight Music Community here. Would you like a copy of this guide? Click on the button below to download a copy. It will be sent straight to your email inbox. Sorry to ask as i’m sure you have told me this before. 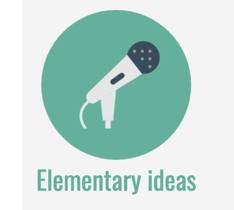 But, new tech guy at school, and i need help to download Garage band saved audio tracks, via microphone onto class folders, for teachers to have access. The tech guy said we’d have to set up some kind of system within the school network..
Hi Zita! I’m not really sure what you’re asking. The students have recorded audio files in GarageBand? And you need other teachers to access them? 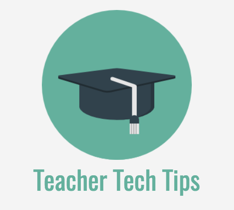 If the students export the file as an MP3 file, they can save them on to a shared drive and then other teachers would be able to listen to them even if they don’t have GarageBand. Does that answer the question? I’m not sure it does! 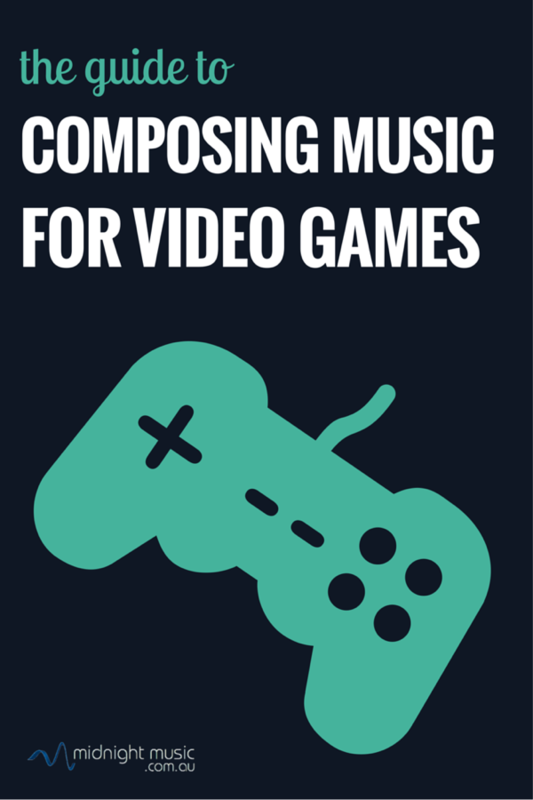 I tips for video game music composing….. I am also a music composer and This information is very useful for me. 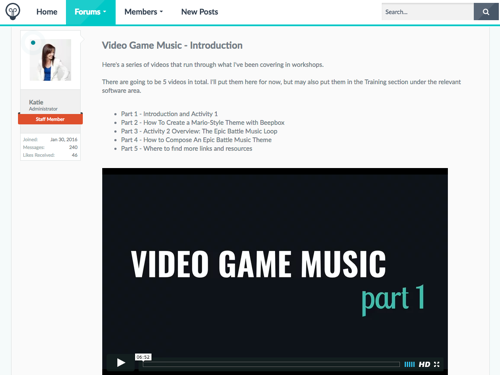 Thank you for sharing this..
Can you recommend any video game composing workshops for advanced high school students? Thanks! 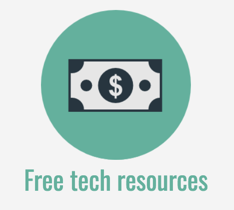 Hi Karen – I have some resources for teachers in my (paid) online community. 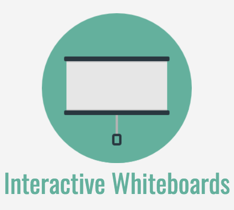 They range from beginner activities through to more advanced and I’m just in the process of reorganizing the materials into a standalone online course. However, the course and materials are for teachers (professional development) rather than for the students to work through themselves. I’m not sure where you’re based, but if you are wanting to send students to a hands-on workshop, you could check out a local film/TV school to see if they have something available. 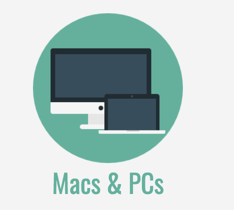 There is also this course on MacProVideo which the students could work through.